Laser hair removal is a very simple process that uses high intensity laser beams to destroy hair follicles without harming any of the surrounding skin tissue. Damaged hair follicles cannot continue to actively grow hair, so laser hair removal is capable of reducing or even eliminating the amount of hair on your body. It’s a flexible system that can be used to address your entire face or just specific delicate areas. You can use laser hair removal to customize your hair removal experience and meet your unique cosmetic needs. Just like women waste time every day shaving their legs, men waste time shaving their five o’clock shadows. Laser hair removal can liberate you from this burden by thinning and eventually eliminating the hair that grows along your cheeks, jaw, lip, and chin. In just one short appointment every four to six weeks, you can reduce the amount of hair you must shave. This also reduces ingrown hairs, razor burn, and wasted time! Women go to great lengths to hide and eliminate their unwanted facial hair. Waxing, shaving, tweezing, and bleaching are the most common yet unpleasant methods used. They are all known to irritate the skin while only delivering temporary results. 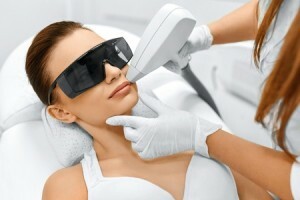 Laser hair removal is completely different because it offers long-lasting results with minimal pain. You can use laser hair removal to reduce the hair along your upper lip, between your eyebrows, on your chin and anywhere else hair shouldn’t be! If you begin your laser hair removal treatments now, you’ll begin to see results in time for the holiday season. Impress family, friends, and colleagues with your refreshed appearance. Call (813) 773-0804 to schedule your first appointment at Tampa Laser Hair Removal in Tampa, Florida.